Cecilia and I had a late night out Saturday visiting with friends. When we came back to the apartment at 3am, the door to the apartment was pushed open. 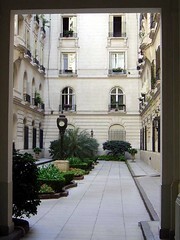 (The entrance to the apartment is from the top floor terrace of the building). We stood there for a minute, looking around, trying to determine what to do. Concerned about the possibility of encountering someone hiding on the inside, I didn’t feel good about walking into the apartment. I decided that we should go down to the street to see if we could find a policeman. There is usually a policeman standing on the corner of our block, but tonight there wasn’t. We waited around to see if a police car would cruise by but no such luck. We remembered that there was a police station about four blocks away on Garay, so we walked there. When we told the police the situation with the apartment, they were very quick to respond. Five police officers jumped into two cars and drove us to the apartment. It’s the first time that I had been in the back of one of those tiny police cars that they use here in Buenos Aires but, I have to say, those little cars move pretty fast. We got to the building. One policeman stayed on the street and the other four went into the building. Cecilia and I followed them up the steps, no elevator here. At the top landing we noticed that the police had their pistols drawn. We stayed back while three of the policemen went inside the apartment; the other cop stayed out on the terrace in front of us by the door. They searched the place and found no bad guys. We went inside and checked for the valuables and everything was where we left it, so we evidently didn’t experience a break-in afterall. Even though the door wasn’t closed, it was locked so we’re not sure how it came open. Maybe it was just the wind, but it remains a mystery. I must say that I am impressed with the response of the Buenos Aires police. I didn’t expect that they would send out so many officers but they were concerned and professional. When it turned out to be nothing, they were courteous and didn’t seem at all bothered that we had asked them to come up to the apartment. It’s nice to have a positive experience with the police. A while back I had I heard a rumor that Cosmos, the independent cinema on Av Corrientes, was about to close. Pasa en Buenos Aires, an interesting, new blog run by the city, provides the details about the eventual closing of Cosmos. (Note: the photo of the cine in that post isn’t Cosmos, which in reality is a rather funky, but endearing, place). Basically, the original owner of Cosmos – Isaac Vainikoff – died a couple of years ago and the place is now owned by his two sons. According to the city’s blog, the sons haven’t had an easy decision about selling but economic issues, and problems with distributors and the tenants on the ground floor have prompted the sons to sell at a price of US $2.8 million, which includes not only the theater but also 16 apartments and 3 stores. (Honestly, while it’s sad to see an independent cinema go, it’s hard to walk away from that kind of money). I’ve not been to Cosmos too often this year. The last time was to see “The Story of the Weeping Camel”, which was shown in the small viewing room that only has 35 seats; the main room is larger. Ceci tells me that the small room used to be much nicer with a sofa and comfortable chairs, more like being in someone’s living room. I don’t know when they changed the small room to the current format. Friday’s Clarín ran an article on Thomas Pynchon as preparation for Pynchon’s new book coming out this December. The Clarín article continues to perpetuate the myth of Pynchon, which certainly makes for a good article. Pynchon is definitely shy about having his photograph taken. A quick search of the Internet indicates that he appears to be leading a comfortable life on the upper west side of New York City with his wife and son. There’s a rather infamous, blurry photo of him walking his son to school. I suspect that with the release of his new book, the availability of camera phones, flickr, and photos going around all over the Internet that Pynchon will soon have a much more difficult time staying hidden from the public eye. Perhaps we may be seeing the end of mysterious Mr. Pynchon if he dares to venture out of his apartment. The Clarín article mentioned several of Pynchon’s books and that made me think that his writings likely appeal to a lot of Argentine readers, who are familiar with bizarre tales. So, I checked a couple of leading bookstores. Tematika.com is the online database of both El Ateneo and Yenyy bookstores. No Pynchon listed. (I love the El Ateneo bookstore on Santa Fé but the quality of their literature selection often isn’t that good). Over at Libreria Hernandez, which always seems to have the best selection of English language literature translated into Spanish. Pynchon’s books are listed as translated into Spanish but only Vineland seems to be available. A couple of titles are listed as “consultar” and others are listed as not available. The book is 992 pages, yikes! An interesting story about that blurb written by Pynchon. It appeared on Amazon then was pulled by Amazon over doubts by its authenticity. Afterall, Pynchon is supposed to be publicity shy. Then the publisher confirmed that the blurb was indeed by the author, so Amazon put it back online. I wonder which will be more interesting, Pynchon’s new book or all the chatter on the Internet about Pynchon’s new book. With the number of New Yorkers moving to Buenos Aires, I’m going to be keeping a lookout for Pynchon in Palermo….hey, he used to live in Mexico City, so why not? One of the blogs that I try to read every week is New Media Musings: Charting the rise of open, democratic, grassroots media. The author of that blog, J.D. Lasica was recently interviewed by La Nación. Not only does Lasica write a great blog about digital media but, more importantly, he is the co-founder and executive director of Ourmedia. What kinds of media will be part of Ourmedia? Almost any kind of digital media. Ourmedia will consist of video (blog video, music videos, television-style reports, documentaries, underground films, grassroots political ads, animation, machinima), audio (interviews with authors, oral family histories, readings of properly licensed book chapters), original music, photographs, ebooks, games, software and more. You decide what goes up on the site. Unlike YouTube, Ourmedia pays attention to copyright and intellectual property. Do you think that viral video sharing is a new headache for established media? Viral video sharing is just the first wave of an important new trend: an increasing appetite by the public for home-grown voices and original programming. Viral video is a crude early manifestation of this. People will create more polished, sophisticated programming in the years ahead. Since you’re reading a blog, you must have some interest in new media. So, go read the La Nación interview with Lasica, check out his blog, and Ourmedia, too. Lasica has made an English translation of the interview available on his blog. Just a few blocks down the street from me is Parque Lezama. During the week I often wander down there for a stroll or to sit on a bench under the shade and admire the Russian Orthodox Church across the street, though I do think that there is just a little too much cyan on the domes of that church. One can usually find men playing chess at one of the tables nearby. On weekends Parque Lezama gets full of families. On Sundays in Parque Lezama I have heard some fairly good local rock bands performing. They just setup their equipment on the grass and play. Mostly, though, I try to avoid Parque Lezama on the weekends because of the crowd and the vendors selling not crafts but socks, underwear, and other things. More sellers have emerged onto Parque Lezama in the past year. The booths now line almost all the streets surrounding the park. I’m not really complaining, though some people in the neighborhood have done so. I’m able to enjoy the park on other days and there are always plenty of things to do in Buenos Aires on the weekend that I have no difficulty finding an alternative. If you haven’t visited Parque Lezama on a weekday afternoon then it’s certainly worth the visit. It actually has the potential to be one of the nicest parks in the city if the city would do a little more maintenance of it. There are some really wonderful trees and the historical museum nearby. Sure, La Boca is to the south and that scares some people. But wander around the side streets to the west of the park, such as Caseros or Uspallata, and you’ll find a nice, little neighborhood. I’m not yet a big fan of 3D buildings in Google Earth and I usually just turn off that option but it’s something to monitor. I certainly don’t think that the new buildings in Puerto Madero represent the best architecture in Buenos Aires. Anyway, it’s a start in the 3D modeling of Buenos Aires for Google Earth. I suspect there will be more of this in the future. 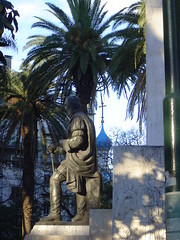 Laura has a good posting about learning Spanish and the dialect used around Buenos Aires. It reminded me about a project at the University of Iowa, Phonetics: The Sounds of English, German, and Spanish. 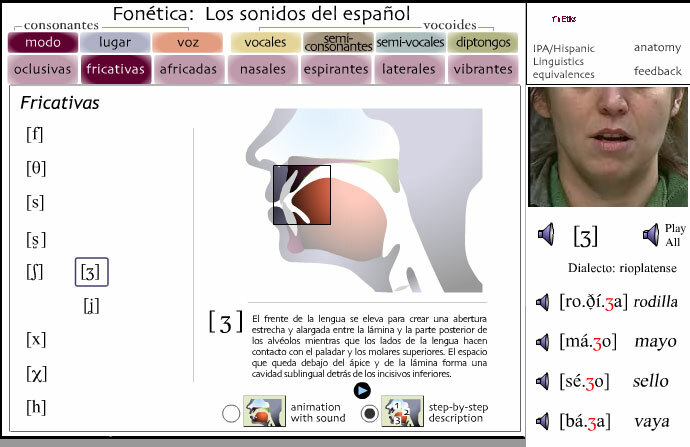 If you have problems figuring out exactly where to put your tongue when trying to speak any of these languages, the Phonetics site has some very good instructions, complete with a flash-based diagram and online audio and video of a person speaking the sound. I was impressed that the site not only has the rioplatense dialect but also the caribeño. In Miami I had a much more difficult time understanding Cuban speakers. The University of Iowa site showed why. The Iowa site is good for those also learning American English, though I don’t think that they got all those ancient Southern diphtongs that we use back in Tennessee! 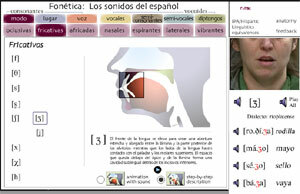 There are now quite a number of audio resources on the net now for learning different accents and dialects. I’ll try to post some more links as I come across them. One of my former colleagues from the University of Miami was in town this week. Schlomit is from Argentina but she has lived abroad for many years, first in Israel and then in the U.S. Her husband, who is also Argentine, just got transferred from Miami to Seattle so she came to Buenos Aires for a few days before making the final move to the west coast. I met her Thursday at the tourist apartment that she is renting off of Las Heras and then we walked to one of my favorite, neighborhood restaurants in that area, Los Piños at the corner of Azcuénaga and French. Ceci and I used to go there a lot when we lived a few blocks away. It’s a pleasant little restaurant in an old farmacia. The lunch menu at Los Piños is the standard that you’ll find anywhere and is 13 pesos. Dinners have a little more variety. Every time I’ve been there it was just people from the neighborhood rather than tourists. It’s nothing fancy, but then again just give me a milanesa or bife and papas fritas and I’ll be happy. I’ve never been one for trendy restaurants and pretentious food. Schlomit and I had a long lunch and a chance to catch up on the Miami gossip. After lunch Schlomit invited me to look at an apartment that they are thinking about buying. Her husband is an executive in the aviation industry, so they’re doing well. They already own one apartment in Las Cañitas and would like to get another investment property here. So, not all the people buying property here, driving up the real estate prices, are foreigners. Many are Argentines who live and work abroad. We walked down Santa Fe towards the Botanical Garden. On the way we passed some famous Argentine TV actor but I forget his name; he looked like he enjoyed being recognized by everyone on Av Santa Fe. The apartment was small, forty square meters, but nice for that size. It’s big selling point was the location, just one block from the Botanical Garden. Indeed, from the balcony, if you looked down calle Armenia you could see part of the Botanical Garden. I admit that it would be nice to live nearby and go for a relaxing stroll among the statues, plants, and trees (and cats) in the Botanical Garden. But, I thought that the price at $60,000 US was just too expensive for forty square meters. Obviously, it’s the location though I tend to think that area is overrated. There are much better buys in other parts of the city that are just as interesting. After seeing the apartment we wandered through the Botanical Gardens, where Schlomit has never been before. She is Argentine but not from Buenos Aires. Then I took her to the only part of Palermo that I really like, which is the part bordered by the Av Las Heras, the zoo, Av Libertador and Scalabrini Ortiz. 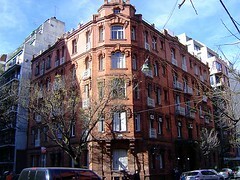 I showed her Palacio de los Patos and La Colorada, two of my favorite apartment buildings in Buenos Aires. I don’t want to imagine the price of an apartment in either of those buildings. I generally find little to read in the English-language Buenos Aires Herald but occasionally the Herald surprises me. In the Sunday edition Herald editor Andrew Graham-Yooll has an interview with Martin Amis, who had been living in the Uruguayan coastal resort town of José Ignacio for the last three years. Amis is married to the writer Isabel Fonseca, author of Bury Me Standing , a very good book about gypsies in Eastern Europe that I do recommend. The couple has two daughters. I’ve never been a fan of Amis, not even sure if I have ever completed reading one of his books but maybe I need to give his work another chance. Anyway, Martin Amis is a major (and very public) figure in the literary world, as was his father Kingsley Amis. I couldn’t find a link to the article at the Herald’s web site so I’m going to quote a significant part of it. “I’ve written a novel, two short stories, and I am on another novel, and a fair bit of journalism. It is a shortish novel, longish short stories, and three quarters of a long novel. That is my schedule…..
“It was looking back on The God That Failed , which had Stephen Spender, Arthur Koestler, and other old boys, that I wondered about the deep temperamental difference between Kingsley and me. He needed Utopian ardour, which has never done a thing for me. I regard it with intense suspicion. It is a temperamental difference, but it is also evolutionary. That kind of thought is now dead. Unless it was forced upon you, as it might be in …Argentina and Uruguay. “The sound of the sea is good for the soul, it strikes you every day several times that you are writing in a form of paradise. But I think the rhythm of writing and creating are deeper than that. Anything that I have got out of here, from this part of Uruguay, I expect to emerge in my writing in two or three years. That seems to be the gestation period between experience and the ability to write about it. “We saw a good example of that with September 11. Norman Mailer, who is now 83, said the temptation to charge in and write something would be an enormous threat. You have to be able to stand back, and let your body feel. Writing is a much more physical process than many people think. You are obeying your body, in some mysterious way. And you always know when you have gone wrong or take a wrong turn in a novel because your body tells you. You known when an idea, or a paragraph, needs to cook. You don’t feel anxiety about it and, a day or two later, you find the idea flows. “Perhaps Uruguay, and José Ignacio, played a part in that, because I wondered how could I write about victims of the Gulag, when I am here. I have never been to Russia, I don’t speak Russian, I have read a lot of Russian history…I just had to do so much authorial suffering, not just sitting around grieving for the victims of the Gulag, although from time to time I did grieve because it was just so terrible what people did and what people suffered….But I had to suffer just to earn the writing. And then I was still very insecure about it. “Now it is back to Stalin again, in a way. Personal, idiosyncratic non universal truth cannot be improved by fiction. The particular is what you are trying to avoid. The autobiographical novel I am writing is sort of historical in that the title I was going to use remains as a subtitle, ‘Inside History’. Isabel’s stepfather, who writes about social justice, said there is a great urge to know where you are inside history. What you have actually lived through. Okay, the title of this post is a little misleading, sorry….literary blog Conversational Reading recommends Manuel Puig’s Eternal Curse on the Reader of These Pages: “this is an extremely Freudian book. The old man has son issues and the caretaker has father issues and, well, they’re pretty Freudian.” ….. that certainly sounds like it has the Buenos Aires influence! If you’re not familiar with Puig, then you may want to browse the overview of Puig I wrote back in December.